Canadian women earned 87 cents an hour for every dollar made by men in 2015, according to new Statistics Canada data released to mark International Women's Day. Canadian women earned 87 cents an hour for every dollar made by men in 2015, according to new Statistics Canada data released Wednesday to mark International Women's Day. The data, which reflects the hourly earnings of Canadians aged 25 to 54, shows the gender wage gap has shrunk by 10 cents since 1981, when female workers earned 77 cents for each dollar earned by men. Statistics Canada says that ratio has improved, in part, due to rising educational attainment by women. In 2015, 35.1 per cent of Canadian women had university degrees, compared to 13.7 per cent in 1990. But even education doesn't completely erase that earnings gap. "Even when they had a university degree above the bachelor's level, women earned an average of 90 cents for every dollar earned by men in 2015," wrote Statistics Canada analyst Melissa Moyser in her report. "The gender pay gap partly owes to the differential allocation of female and male workers across occupations," wrote Moyser. "Women are overrepresented in low‑paying occupations and underrepresented in high‑paying ones." Canadian women are still more likely to work in traditionally "female" fields like teaching, nursing, social work, sales, service or administration, according to the report. In 2015, 56.1 per cent of women worked in those fields, compared to 17.1 per cent of men. That's not much different from 1987, when those figures were 59.2 per cent and 15.7 per cent respectively. In professional science jobs, 75.6 per cent of workers were men in 2015, reflecting significant gender imbalances in fields like computer and information systems and engineering. Gender parity has been reached in the public sector, however. In 2015, women comprised 54 per cent of legislators and senior government managers, which the report attributes in part to employment equity laws for public servants. In the private sector, women made up just 25.6 per cent of senior managers in the same year. Canadian women remain less likely to be employed than Canadian men (77.5 per cent for women and 85.3 per cent for men in 2015). Women are also more likely to work part time (18.9 per cent for women and 5.5 per cent for men), often because they're caring for children. That means women worked fewer hours per week in 2015, and were more likely to be away from work during the week. When women took involuntary time off from work, they were more likely than men to cite illness, disability, personal reasons, or parental leave. The disparity in hours worked, wrote Moyer, means annual wages can be "a problematic measure of gender‑based pay inequality." 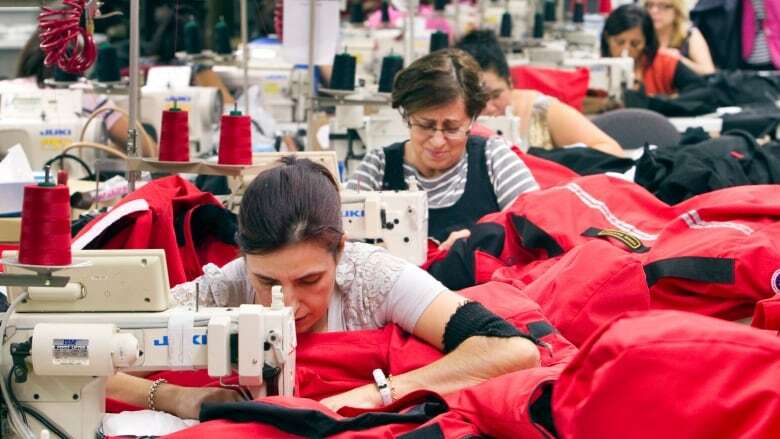 "While annual earnings reflect both the price of labour and its quantity, the hourly wages of full‑time workers reflect only the price of labour, and they are therefore closer to the issue of gender‑based discrimination," wrote Moyer. When measured by annual wages, women earned 74 cents for every dollar earned by men in 2015. Research released today by RBC Economics tells a similar story: The gender pay gap has shrunk, but still exists, women are more likely to work part-time and perform unpaid labour, and are still more likely to work in traditionally "female" professions. But the paper from RBC economist Laura Cooper also casts light on some improving trends for women in the workplace. Women comprised the majority of Canadian employment gains in 2015 and 2016, a reversal of the trend for 2013 and 2014, wrote Cooper. Also, the labour force participation rates of older Canadian women have increased, with a record 32 per cent of women aged 55 and older taking part in the labour force in 2016. In 2000, that figure was 19 per cent. As the working population ages over the next two decades, improving female labour force participation rates "could act to partially offset the projected slowdown in economic growth," wrote Cooper. Like Statistics Canada's report, the RBC Economics dispatch shows that women are underrepresented in private sector leadership roles in Canada. Just 2.6 per cent of women were in charge of incorporated businesses in 2014, compared to 6.5 per cent of men. That still puts Canada second among G7 countries in this metric, after Italy and ahead of Germany, France, the U.K., U.S. and Japan.